For most of the year, wildlife activity peaks at the edge of days. At first glance one might surmise that wildlife lead a rather relaxed life, but all roads lead to winter and there is little time to spare. The beat of every wing and the step of every paw and hoof are purposeful actions driven by the change of seasons. At no time is the great race more visible than in autumn. When Grafton’s hills are set ablaze by fall color and ponds and lakes begin to freeze up north the drumbeat quickens. Evidence can be seen all around us. Gray squirrels scurry in the seemingly endless pursuit of acorns. Brightly colored songbirds vanish, one by one, from backyard feeders. The rut propels bucks, which are solitary and elusive by nature, to chase does throughout the day. Beavers step up their pace of cutting and submerging tree limbs that will serve as their sole food source when winter locks them beneath ice. 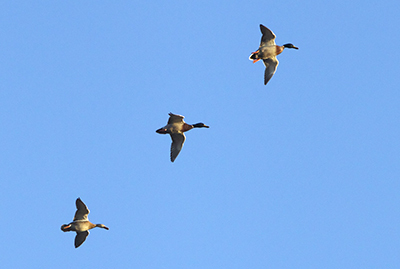 But one of the most the amazing visual spectacles signaling the approach of winter is the migration of waterfowl. Across North America, tens of millions of ducks and geese are forced to fly south as freezing temperatures restrict their access to important food sources and limit the availability of open water upon which they spend the balance of their days. Flight birds from the north, pushed southward by cold fronts, join resident ducks and geese that are in turn pushed south by increasingly colder temperatures. Grafton lies in the Atlantic Flyway so most of the waterfowl passing overhead originate from the Canadian Maritime Provinces, as well as northern New England. Lesser-known species of waterfowl from the Central Flyway will sometimes drift eastward through Massachusetts on their southward journey. Look skyward in autumn as temperatures drop you will begin to notice larger and larger flocks of ducks and geese. Smaller ducks with fast wing beats that appear for only an instant as they pass over your part of town are likely wood ducks, which are arguably the most colorful of all North American waterfowl. Their speed and aerobatics truly impress. Flocks of larger ducks with slower wing beats are usually mallards or the lesser-known American black duck, which breeds in the Canadian Maritimes. The familiar green head of the male mallard and the unique markings and bright red-orange feet of the black duck are tough to see when birds are in flight, so size and wing cadence are the best way to identify these birds. 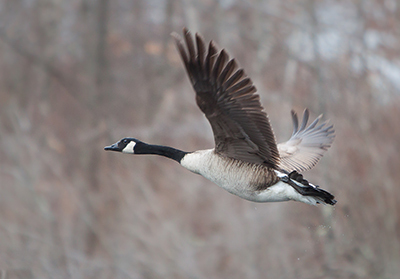 Although Canada Geese are increasing their year round presence in Massachusetts, they remain the most recognizable of all migrating waterfowl in our region. Typically heard before seen, the honks of these migrating geese can be heard from great distances and it sometimes takes a keen eye to spot their V-shaped flight formations as they pass by at impressive heights. Sightings of Snow Geese over Grafton are rare, but increasing. They are bright white, as their name suggests, with black-tipped wings. The Snow Goose breeds in large colonies on the Canadian and Northern Alaskan tundra, from the high arctic to the subarctic. There are three regional populations, one of which lies in the east, and their numbers have grown to such an extent in recent years that the birds are causing considerable damage to their limited breeding habitat. Snow Geese are possibly the noisiest of all waterfowl. Their main call, made by both males and females, is a nasal, one-syllable honk. Distant calling flocks are reminiscent of a pack of baying hounds. Their flight call is a continuous chorus of shrill cries, hoarse honks, and high-pitched quacks, audible both day and night. For these reasons, you will likely hear Snow Geese before you see them. Snow Geese typically fly at very high altitudes during their epic migrations so binoculars are often needed to get a good look at them. If you are lucky enough to see a flock land you will witness what looks like a bright white tornado of geese spiraling downward and spreading out in an ever-widening circle of hundreds, if not thousands, of Snow Geese. The mantra of all wildlife in the face of winter’s approach is “adapt or flee”. So regardless of where your wildlife watching interests lie, autumn provides you with a front row seat to the greatest race of all.